Since getting my allotment last month we seem to be overrun with rhubarb. Having fed the family copious amounts of crumble, I decided to give cordial a go after being inspired by BBC 2's Allotment Challenge. Whipping up a cordial is easier than I thought it would be - all you need is a sieve and muslin cloth. Boil rhubarb and lavender with half a glass of water and a good sprinkle of sugar for an hour or so (be careful with the lavender, it's rather overpowering and becomes stronger during the simmering process). Once the rhubarb has turned to mush, pour the mixture into a sieve lined with a muslin cloth and place over a bowl. Leave overnight to allow all liquid to seep through - weighing the mixture down will help extract liquid (I used 10k weights from my boyfriend's home gym equipment as they were round, heavy and fit in the sieve). The cordials strength will vary on it's water content. 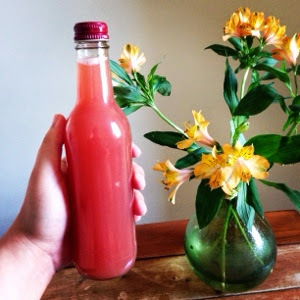 You'll find each batch will taste different depending on the sugar content of the rhubarb. Measurements can be adjusted depending on individual tastes.